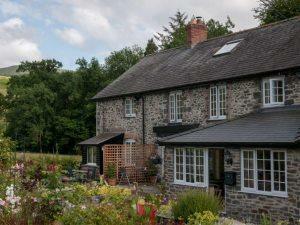 The Old Coach House Cottage01650 511333work Self-cateringAdjoining the owners' property, the Old Coach House Cottage is conveniently located between the market towns of Machynlleth and Dolgellau in the Dyfi Valley, close to the southern edge of Snowdonia National Park. Beautiful beaches at Aberdyfi and Barmouth are only a 40 minutes drive away. The property is about 160 years old and was originally the coaching quarters for Dolcorsllwyn Hall. It is ideally situated for walking, cycling and bird watching, or just relaxing. There are several good pubs with restaurants a short drive away. The cottage was extensively refurbished in the winter of 2016 and now comprises an open plan kitchen, breakfast bar and sitting room on the ground floor. Upstairs a good sized bedroom overlooking the pretty cottage garden can be made up as a super king or twin room. The modern bathroom has a large walk in shower with grab rail and shower seat. The well equipped kitchen has an oven/grill, a microwave and washing machine. Tea, coffee and hot chocolate are provided on arrival. Our welcome pack includes home made cakes and jam and local free range eggs. Other items will be provided depending on the length of stay and season. Our garden overlooks the Dyfi river and is an ideal spot for relaxing, either in our little summer house or one of the many seating areas within the garden. We have an interesting variety of birds visiting the garden and you can see dippers and wagtails on the river. We are only twenty minutes away from the Dyfi Osprey Project, which is proving to be a great visitor attraction. If walking or cycling is your preferred activity we are ideally situated for visiting Coed y Brenin cycling centre, the Arrans and Rhinogs or Cader Idris. Whatever your reason for coming to stay in Mid Wales we are sure The Old Coach House Cottage will provide you with comfortable accommodation and a warm welcome. Prices are reduced from £80pn to £70pn if booking for a three-night stay. Further reductions are offered for longer stays. Please contact by phone, text or email for details.